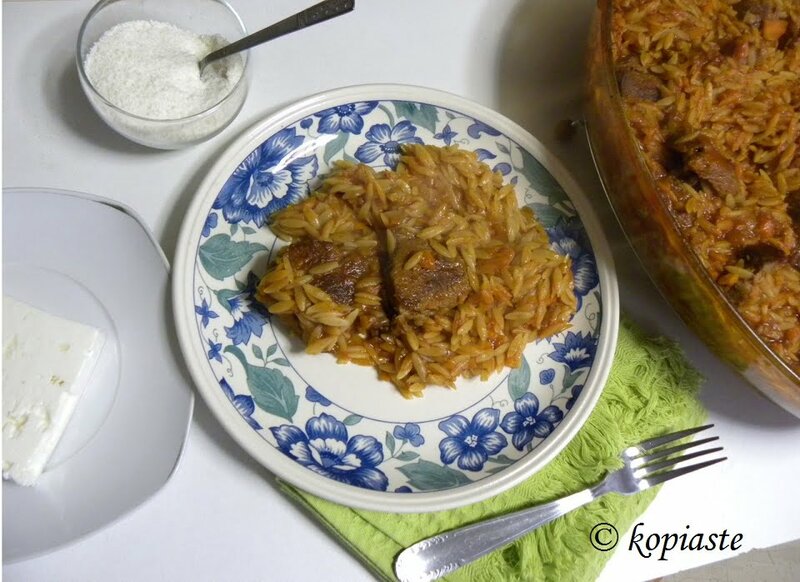 Moschari Kokkinisto me Kritharaki is a Greek dish made with stewed veal and orzo pasta is cooked in the sauce. Although this dish is usually cooked with veal, it can also be made with beef of buffalo meat, lamb, pork, rabbit or chicken. The veal is cooked in a tomato sauce and the cooking time differs for each kind of meat. After the meat is cooked the pasta (usually orzo, hilopites or other type of small pasta) is added and cooked in the sauce. In this recipe, I used “kritharaki” (orzo), which looks like rice but its bigger than rice and comes in three sizes: small, medium or large. I usually cook the meat in a pressure cooker, which takes around half an hour and I then transfer the meat, together with the sauce in a pyrex, add more water and cook the pasta. You can also cook it on the stove top in a regular pot but more time will be need to cook the meat (around 1 hour and 15 minutes) and of course more water will have to be added. Today I made this dish again making a few changes to my original recipe which are worth mentioning. I have marked the changes in red. I used my spice mixture which gave such wonderful flavour to the sauce where the pasta was cooked. Wash, peel and blend the fresh tomatoes. Wash, cut and drain the meat. Heat the olive oil in a pot (or pressure cooker) and sauté the meat in batches on both sides. Remove to a platter. Put all the meat back in the pot and add the onion and sauté for a few minutes and then add the garlic and sauté, for a few seconds and finally the carrot and celery and mix for 2 – 3 minutes. Add the wine and cook for a couple of minutes until the alcohol evaporates. Add salt, pepper, cinnamon stick, all spice berries, bay leaf, my spice mixture, tomato paste, fresh tomatoes and 2 cups of water. Bring to a boil, cover pot with the lid and simmer for 1 hour and 15 minutes, or until the meat is tender (or ½ hour in the pressure cooker after the valve turns). Preheat oven to 180 degrees C / 350 F and transfer the cooked meat with the sauce into a Pyrex or baking tin. Discard the bay leaf and add the hot water. Add the pasta and cook for about 20 minutes, stirring occasionally. Add more water if necessary. Allow to rest for ten minutes and serve while warm. Grate some myzithra cheese on top and serve with feta. Heat the olive oil in a pot (or pressure cooker) and sauté the meat in batches on both sides. Remove to a platter. Put all the meat back in the pot and add the onion and sauté for a few minutes and then add the garlic and sauté, for a few seconds and finally the carrot and celery and mix for 2 - 3 minutes. Add salt, pepper, (cinnamon stick, all spice berries), bay leaf, my spice mixture, tomato paste, fresh tomatoes and 2 cups of water. ¤ Fresh tomatoes are pealed easily if make an X cut on the back side an we put them in hot water for a few seconds. ¤ The easiest way to grate the onion is to do it in the Multi moulinette (food processor) with a couple tbsp olive oil, which you reserve from the quantity mentioned in the recipe. A few spins are enough as we don’t want to puree the onion. This way we save time, effort and avoid tears. ¤ You can add any or all of these spices: cinnamon stick, allspice berries, cloves, nutmeg, black pepper. ¤ If tomatoes are tart, add a grated carrot or a tablespoon of ketchup or honey in the sauce. ¤ Put hot water in the pyrex, you gain about 10 minutes cooking time. ¤ Meat: Use any meat suitable for a stew. ¤ If you cannot find myzithra, substitute with kefalotyri, halloumi or parmesan. I know I wil like this.. Will definitely try and let you know. We don't get Veal here, so maybe I will use mutton. Γιατί μου το κάνεις αυτό??? Εγώ ακόμα στις σαλάτες είμαι… Τρίτη εβδομάδα τώρα. Πάντως η συνταγή είναι τέλεια!!! I just discovered your website through the Carole’s Chatter linkup and I am glad I did, because I love Greek food, and giouvetsi is one of my favourite dishes 🙂 I’ll have to try this recipe very soon. I am feeling very glad to view your videos!!!!!!!!!!!!!!!!!! Love veal. These are my favourite dishes …………. I will try this dish very soon!! !